As many of you know, my sister in law, Carolyn Dickson has been suffering from pulmonary fibrosis for many years. Her doctors at the University of California San Francisco Medical Center have told her that her only option now is a life-saving double lung transplant. She has remained positive, cheerful and is looking forward to a second chance at life. Carolyn and her husband Larry live in Fresno, California where they are active members of the community. Carolyn has a son and four stepchildren. She and Larry have sixteen grandchildren and two great-grandchildren. She is a veteran of the U.S. Air Force, worked for Sperry Univac, working in public relations and internal communications. After a successful career with Sperry; she left to work for Waste Management as a sales coordinator and editor of their regional newsletter and currently works for Republic Services as their community relations manager. Carolyn also loves her ministry work with the Mid-Valley Christian Men’s and Women’s Job Corps and looks forward to being able to spend more time coordinating its mission. The cost of the surgery is high, as are the many additional expenses that are involved. Out-of-pocket expenses, not covered by insurance, can be overwhelming. For example, Carolyn will need to stay in San Francisco, close to the Medical Center, for at least two months after the surgery, with her husband Larry as her primary caretaker. Nearby hotels and apartments average $3,000 a month, not including meals, medications, parking, lab fees and co-payments. Carolyn is very hesitant about asking for help, but we want her to be able to concentrate on a successful recuperation and recovery and not worry about mounting bills. To help with the financial burden of Carolyn’s uninsured expenses, a fundraising campaign in her honor has been established with HelpHOPELIve, a trusted nonprofit organization that has been providing community based fundraising guidance to patients and their families for more than 30 years. All donations are tax-deductible, are held by HelpHOPELive in the Southwest Lung Transplant Fund, and are administered by HelpHopeLive for transplant-related expenses only. Please consider a tax-deductible end of year contribution. On behalf of Carolyn, Larry and our families, thank you for your kindness, generosity, support and prayers. In two days I will celebrate my 6 month birthday. Yep, the Twins will be six months and I am feeling great, praise the Lord. Had my six month check up at UCSF yesterday and doctors’ feel I am doing great and on target. I appreciate all the kindness and support. May God keep blessing you all. On July 23rd, I will have completed my 4th month with little or none complications of my double lung transplant. Praise God. Thank you all so much for your donations, we are so appreciative. I was discharged from actually staying in the 30 minute distance from UCSF Medical Center on May 10th; however, my husband, Larry, drives me back for testing and clinic once a month visits. All in all, I feel wonderful and have had the opportunity to speak of this miracle at a Rotary Club meeting, a church and a pulmonary support group in hopes to encourage others. It is a blessing. Good news! 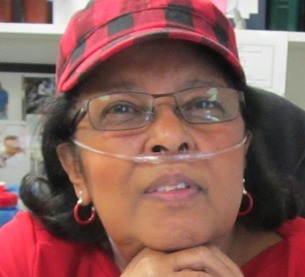 Carolyn had her lung transplant on March 24, 2016. She is doing well and should be released soon from the hospital to recuperate for 6 weeks or so at an extended stay hotel, near the UCSF Medical Center. She still has many follow-up appointments at UCSF. Carolyn extends her thanks to the many friends and family members who have supported her through her long wait and for their continuing prayers and well wishes!! I have it on good authority that Angels are all around you!! Sis, Thanks for being there for so many of us with your time, talents and caring (and the good cooking). Our love, prayers and good wishes are with you now, as always.